The main source of pollution from distilleries is the Spent Wash – a nontoxic biodegradable effluent. A huge amount of effluent is generated in the distilleries, as per experience 10-15 KL of distillery effluent is generated for production of 1 KL of Alcohol. 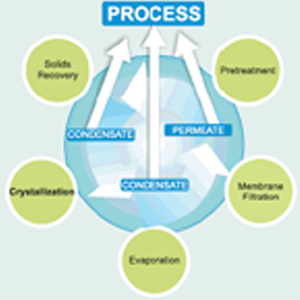 Despite many efforts made so far, a comprehensive treatment process could not be explored. 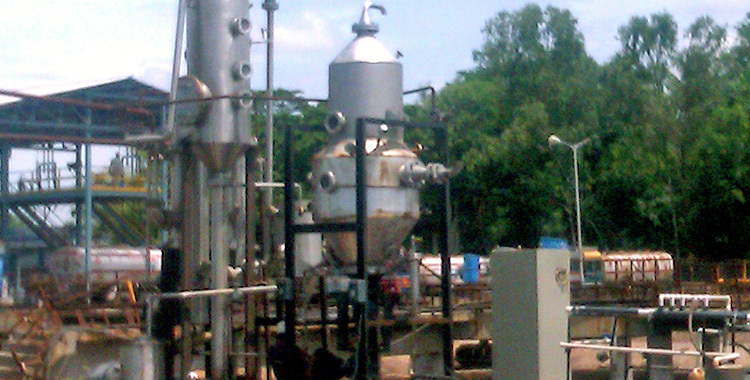 Chem Process Systems came up with a unique innovation in the field of distilleries. Spent Wash treatment by Thermo-Vacuum Evaporators, recovery of salt from the condensed molasses soluble, a remarkable synchronization with existing technologies. 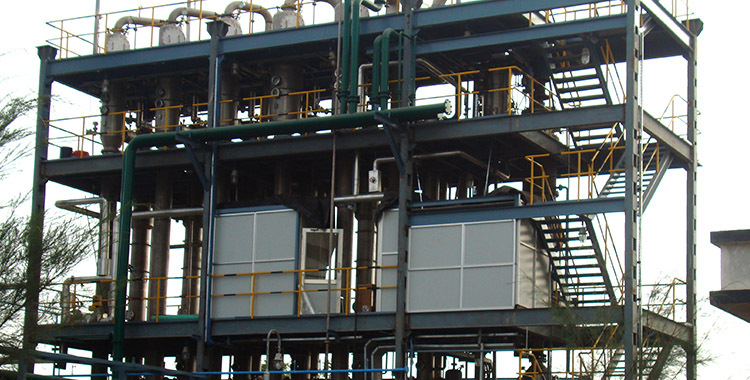 Our Thermal Evaporators have been successfully developed and used over the last 20 years for the treatment of difficult liquid wastes; containing oil emulsions, dissolved salt, heavy metals, hazardous chemicals, suspended solids etc. It is a simple robust and reliable process. Industries utilize the best existing technologies that yields considerably low Spent Wash for alcohol generation. 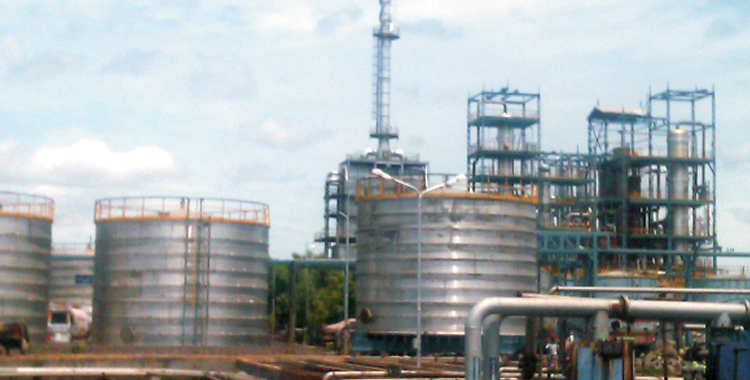 This spent is then sent to Chem Process’ unique innovative evaporation system for further treatment and hence salt separation. Any Thermal Evaporator consists of three main parts: Heat Exchange, Vapor Separator and a Recirculating Pump. In the Heat Exchanger, the liquid is heated under pressure to avoid boiling on the heating surface. Our shell and tubes are specifically designed to ensure high re-circulation flow with high turbulence resulting in a non fouling operation. After heating the pressure is released over a pressure control valve into the Vapor Separator. The liquid partially evaporates and the vapor leaves the vapor separator. The vapor can either be used as heating media in MVR, TVR or Multi-effect Evaporator. 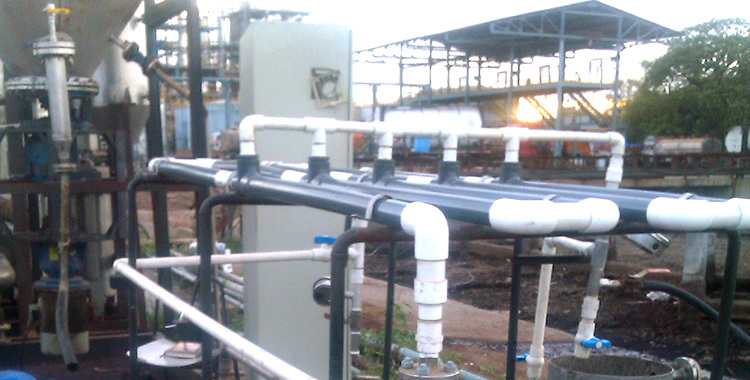 The produced condensate can either be reused further, treated or discharged to recipient. The liquid is kept in circulation by the pump. Fresh liquid is fed in the vapor separator and concentrate is continuously bled out. The Forced Re-circulation type can be operated either continuously at a high concentration level or if desired in batch mode. High concentrations are achieved in batch mode. The system is directly heated, hence a fair amount of energy can be recovered by using evaporated water for other process or for heating purposes. Multi-stage designing can help utilize the heated vapor of one stage to other stages, hence lowering down the steam consumption. We strive to bring the best technologies for energy efficient and pollution free environment. The Thermal Evaporators provide a robust, compact and trouble free process for effective recovery of salt from condensed molasses soluble for distilleries by desalting of Spent Wash.